With warnings of icy weather next week, today was all about pressing ahead with outdoor plantings but adding some protection for the vulnerable items which are already growing. 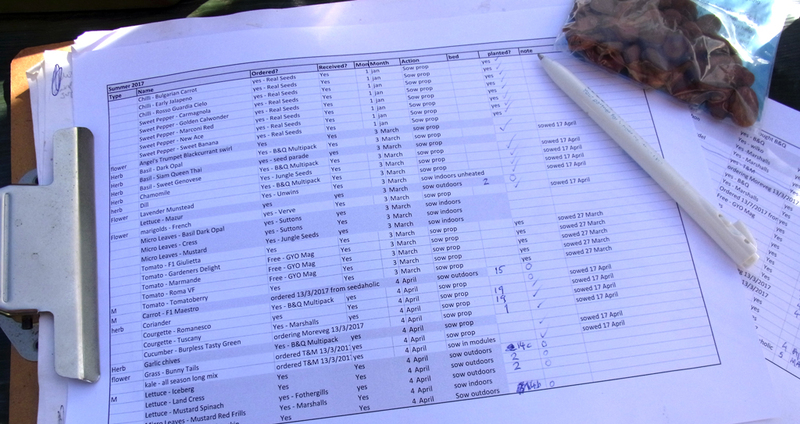 With my 2017 growing list now sorted out, it was a pretty straightforward matter to plan what will go into which of the raised beds. The list isn’t especially pioneering in terms of varieties, but I want to be sure of getting reliable crops of the staple vegetables we like to eat, so there are old favourites like Charlotte potatoes and Sutton broad beans. 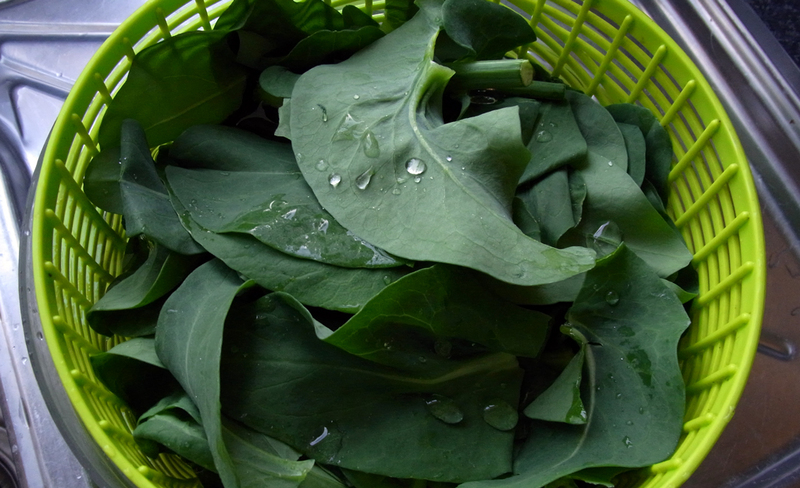 If there is any sense of adventure it’s probably in some of the pepper and chilli varieties, the several different kales and above all else my utter, unstinting determination to grow samphire – even just once! That’s the lovely strandy marsh samphire that costs so much in the shops as opposed to the not particularly impressive rock samphire which I did grow once before. This is a vegetable where success has always eluded me. The all-important drenching the soil every day with salty water is easy enough to do but I’ve had attempts where literally nothing has come up. To be honest I’ve twice had samphire seeds from one of the large suppliers where the seeds appeared more like scraps and dust, so do wonder whether I was flogging a dead horse in the first place. This year’s pack is from a different supplier and they do look a bit more substantial, so it’s Saxa salt at the ready and fingers crossed. 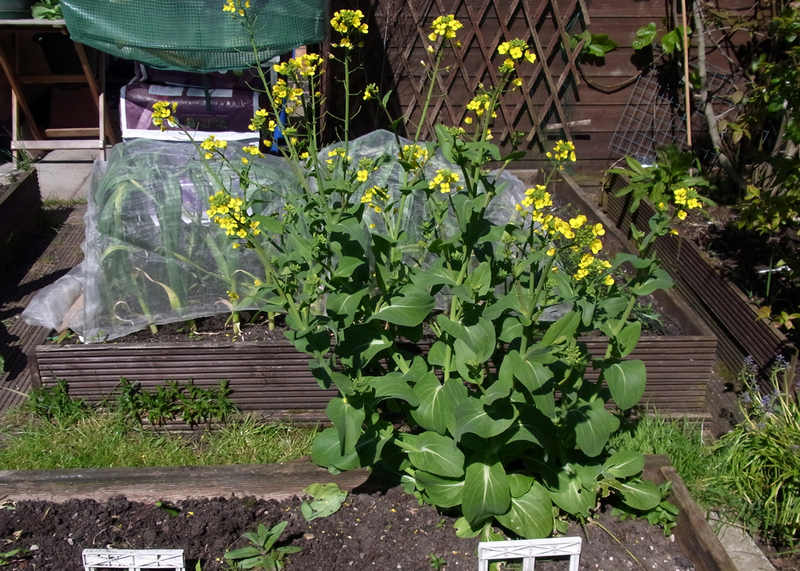 First up today was cutting down a row of pak choi plants which I’d let go wild over winter. They’ve recently flowered, the buttercup-like yellow flowers attracting some nice furry bees, but they had to go. Taking off the biggest leaves in the kitchen made for a big pile of greens, which soon wilted down in some hot water and went into the freezer. 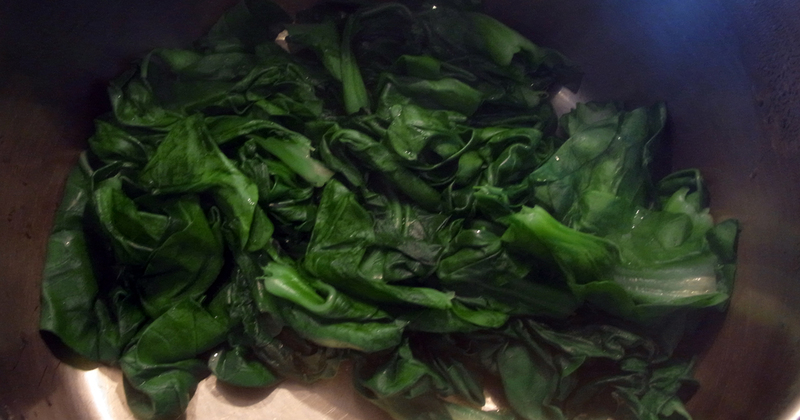 It won’t be the usual crisp stir fry pak choi, but can be used as a good spinach substitute. Pak Choi leaves before ..
That freed up a bed for potato planting. 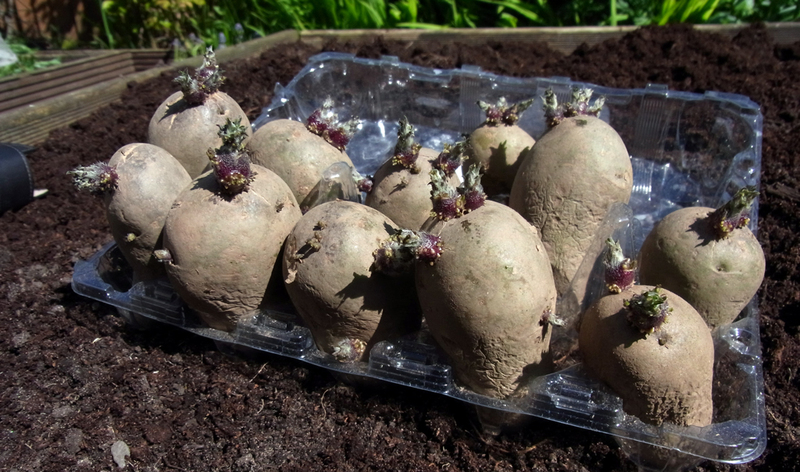 I had ten Charlotte seed potatoes which had been chitting on a window sill since the end of January and now had good strong-looking sprouts on them. So I dug a small pit for each one, sprinkled some potato fertiliser in (boy that stuff smells awful! 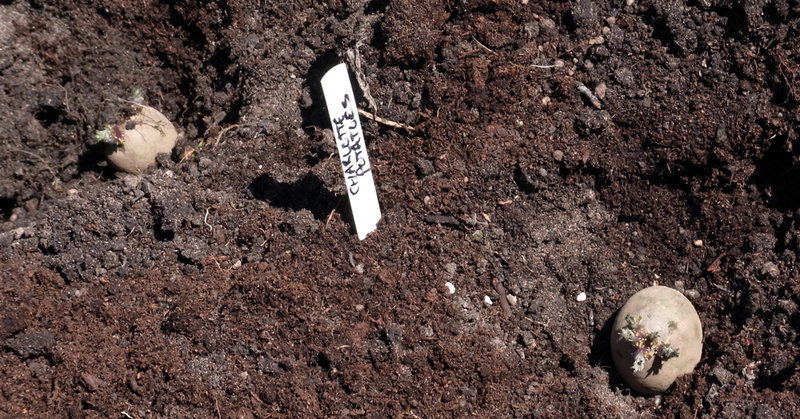 ), planted the spuds and covered them. With the impending cold snap I put a mesh tunnel over to try and keep a bit of still warmer air in place. Alongside is one of the full-sized beds and I gave that a good dig over and topped it up with a big bag of compost. BBC Gardener’s World on Friday featured the no dig method, championed by its ‘inventor’ Charles Dowding. I can see the logic of letting worms do all the work but soil can get so compacted over time that it’s a nightmare for things like carrots, which need soft, lightweight, free moving soil. Carrots were going into this bed today so digging was the order of the day, breaking up clumps with a fork and lightening the texture with the compost. I can’t say I’d ever found it difficult to see carrot seeds, but today’s had been deliberately tinted for better visibility and it did indeed make sowing easier. Then it was a simple case of sowing: a swede variety called Gowrie, a row of Sugarsnax carrots, a row of Maestro carrots (a gorgeous F1 Nantes-style, with good carrot fly resistance), a row of Cylindra beetroot (great shape for slicing), another of good old Boltardy beetroot and then two rows of Castandel French beans. Oh and a square in one corner for the samphire patch. 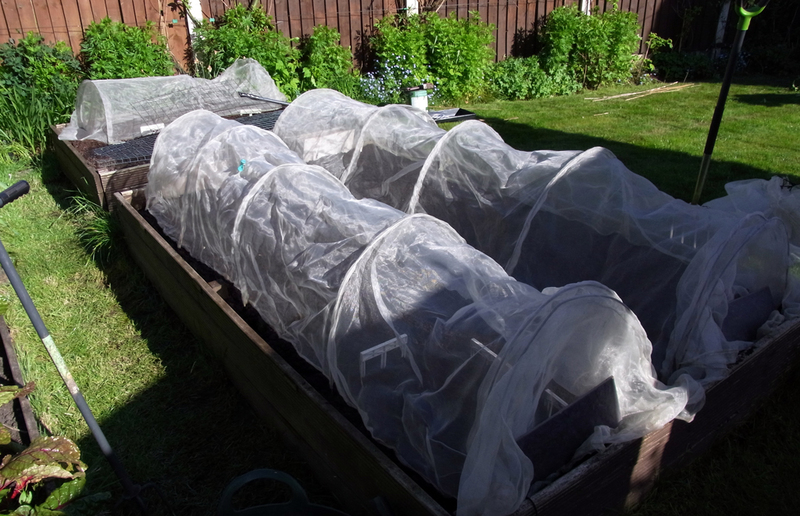 Like with the potatoes, it seemed wise to put mesh tunnels over for the coming cold snap. Sowing everything else in the other beds will wait until next weekend (the day job doesn’t half get in the way of gardening), but in the meantime there’s a great row of Swiss chard and the garlic is looking healthy too. Both were overwintered. Overwintered garlic, still with a few months to go. 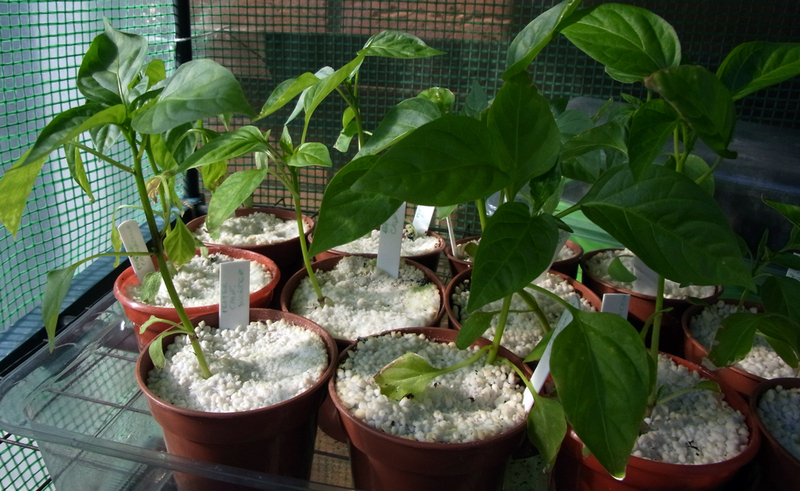 In one of the mini greenhouse tents the sweet peppers and chillis are doing well, all about four inches tall and starting to thicken up. The tomatoes are still indoors as they’re quite spindly and small yet. I hope they get a move on soon. 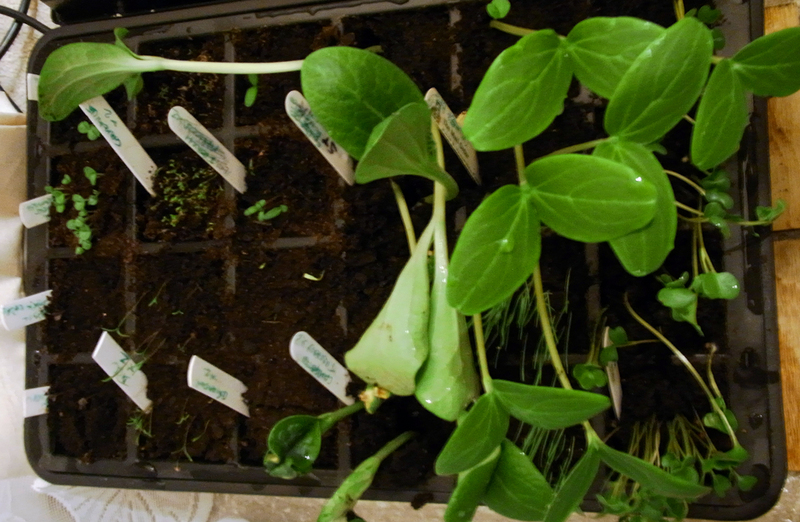 I sowed all sorts of things in one of the heated propagators last Monday: courgettes, cucumbers, chamomile, basil, dill, coriander and marigolds. Six days later and nearly everything is up; the courgettes have done almost too well so I’ll need to get those into pots and out of the continuous heat in the next few days. Courgettes: from seed to Triffid in six days. ‘Continuous heat’ .. what a luxury that would be at the moment. I do hope the cold snap isn’t too bad and is over by the weekend. Not least because I’ve half of that list above still to sow. Stand by your beds! Blimey! That’s some list. I’m holding back for a week or two in case of frost. Downside is the greenhouse is getting crowded. I’ve a post like this one going up tomorrow. Good luck! What a wonderful array of crops planned for the new season. I wish you every success. Thanks Sue 🙂 Just need lots of sunny weather now! Good growing list! All mine are in the greenhouse waiting for it to warm up so they can get planted outside. Not long now til it heats up if the forecast can be believed! Remind me never to ask you to look after anything living! Ha ha. Probably a good shout where tomatoes are concerned!